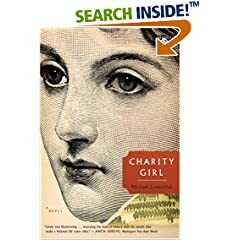 In Charity Girl, Michael Lowenthal examines a rather unknown and dark period in American history in his fictionalized account of a detention center for women during World War I. Frieda Mintz is only six months shy of eighteen when she has run away from an overbearing and unloving mother. Trying to survive, Frieda works as a package wrapper for the Jordon Marsh department store in Boston. Through a series of unfortunate events, trusting the wrong men, and not following her best friend’s advice, Frieda contracts a venereal disease and is accidentally arrested on the streets of Boston. Held on no charges, Frieda is sent to a women’s detention center, in a house that a month earlier had posed as a brothel. Lowenthal’s chilling account of Frieda’s stay at the dreary center, with its unabashedly racist and sexist overseers manages to stay on the right side of the fine line between sensational and respectful. Dealing with a topic of female sexuality during the early 1900s, when such acts were considered taboo, Lowenthal’s work manages to stay realistic, mostly because it is told through the eyes of a very naive young girl hoping that the man who infected her will come back to save her. While the characters are not particularly endearing, in fact they are rather frustrating in their stubbornness. They are, however, representations of wronged women. Women just to make a life for themselves independent of their families or of men. An article in the Boston Globe sheds some light on the history behind Charity Girl. “During World War I, thousands of American women were held in detention centers across the country, sometimes for months at a time. The charge? Possibly being infected with venereal disease, which meant they might pose a threat to US troops. During this anti-vice frenzy, a woman could be arrested if she ventured too near a military base; her only “crime” was being dressed too flashily or simply walking alone. Author Michael Lowenthal, who teaches at Boston College, came across this shocking story when he was browsing through Susan Sontag’s “AIDS and Its Metaphors. ” What captured his attention was “30,000 Women Arrested in U.S. During World War I, Held on Suspicion of Having VD; 15,000 of Those Who Tested Positive Held.” (Carol Iaciofano, The Boston Globe, 1/29/2007). Unable to find any further information on what happened to those women, Lowenthal fictionalized their lives in his gripping historical novel. In my high school history classes World War 1 was pretty much neglected so that we could focus our studies of World War 2; the continuation of what World War 1 did not accomplish. In either case, little attention was paid to what happened on US soil during World War 1, and the injustice held against the women in the early 1910’s which eerily foreshadows the future detainment of Japanese-Americans in determent camps during World War 2.